MyDateIsHere.com is a new entry in the vast seemingly endless universe of online dating sites. This site claims to be different though since, in their words, they are “A site that doesn’t rely on arbitrary formulas to match people up, but instead a site designed to get people meeting face to face sooner rather than later.” This is a principle I can agree with because we have all gotten our hopes up to meet someone in person that we met online. Only to realize they are nothing like the person we dreamed up in our heads, and that they only have one good camera angle. The site certainly isn’t the be all end all of online dating sites. The site is 100% free to use so that’s a huge plus since you can’t be to disappointed with something you didn’t pay for. I’m not saying you’ll for sure be disappointed by the site, but their isn’t too much to get excited about. The site does allow free video chat in an effort to get people interacting face to face as soon as possible since they feel this is the best way to get to know someone. I defiantly agree with the logic as I’ve proved through multiple article I’ve posted on this site. So it excites me that this is the site’s mission statement, since there is a ridiculous amount of sites about there dedicated the stupidest most irrelevant or judgmental crap about dating like your look or whether you smoke way to much pot. It makes MyDateIsHere feel as if it servers and actual purpose instead of just being a site that’s amusing for a few minutes before you realize its been a complete waste of your time. - “I’m Free” switch on your profile page can be turned off or on to indicate if you are available to meet up and go on a date at that given moment. This is a good way to find a quick hook up or a date by seeing who available and ready now instead of cruising through profiles and having to send messages and wait for a response. You can also choose to display how long your available for whether its 4 hours or 24. - They also have a chat feature which you can turn on and off incase you want to just casually search through some member profiles and look for someone very specific instead of just finding whatever you can quickly. - The search feature is very basic only having 6 different generic search terms like what you’re looking for (male or female), how close they are and if they are online. You can save your search terms and results and come back to view them when ever you like. - You can add users to your “favorites List” and find them quickly in the future be viewing them on your friends page. The page will also tell you if any of your friends are nearby. - You can send a users a gift while viewing their profile page. You can send them what I believe is just pictures of seemingly romantic stuff like the Eiffel Tower in Paris, a coffee mug covered in hearts, creme brulee, a picture of a dog and cat kissing and a few different types of flowers. This unfortunately is not included in the free offer as you need to pay for the gifts with credits. - You can also block a user if you don’t like that you see or they’re constantly attempting to connect with you after you have made it clear you aren’t interested. You can also go back and your blocked members from your profile page, just incase you change your mind. 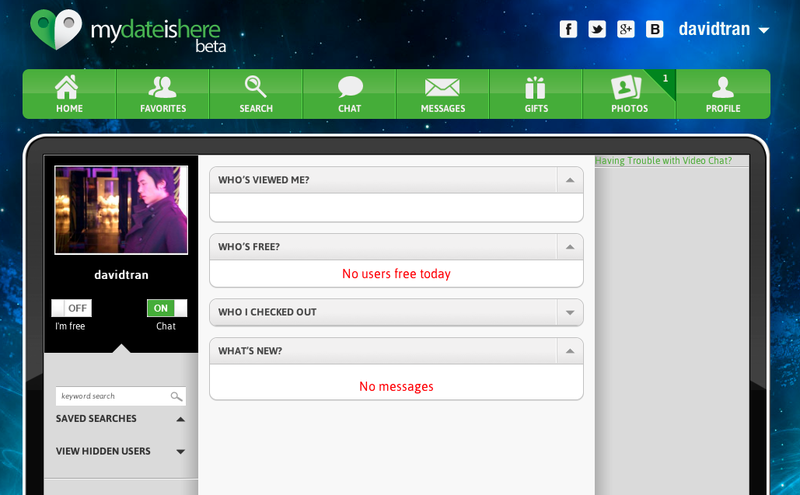 - The site has a free “Chat” option that allows users to have face to face conversation via web cam. The site promotes meeting members face to face as quick as possible since they feel this is the best and quickest way to get to know someone. - The profile settings allow you to turn off any email notifications and also allows you to turn off the advertisements and even the pop up window if you don’t want to be bothered by them. - In your profile setting you can fill out the field ”I am up to”. You can put anything in there that you would like whether it be the default grab drinks and go to the movies or something very specific that you’re looking for in particular. MyDateIsHere.com has a very small membership base, based on the fact that the site is quite young and still trying to establish its self in the vast universe that is online dating websites. The site has pretty basic features in comparison to a lot of the bigger dating sites online, but the site is free to use which helps since it doesn’t need to match up with a site like Lava Life that charges you about $60 a month for a membership. MyDateIsHere is new so the membership base is low, but it will only continue to grow. The site is 100% free to use so if you do decide to join and the site isn’t what you were hoping for then you are left in the same position you started with since there is no risk of wasting your money, your time is a different story. I don’t think the site will be a disappointment since it does promote one very important thing I feel is something a lot of site over look when it comes to online dating and that’s the free video chat feature that allows you to meet the person kind of face to face. This is something I’ve always said is important and it also allows you to avoid that awful moment when you meet your date in person and after getting your hopes up and building them up to be this great person and immediately being disappointed and discouraged. I think the site has potential to be a great place for people to meet online, so be one of the cool kids and start using the site before everyone else does so you can brag about how you have been using the site already.